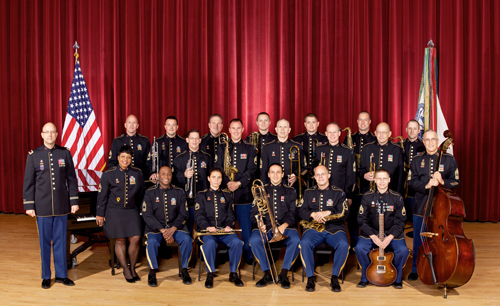 The Jazz Ambassadors—America’s Big Band is the official touring big band of the United States Army. This 19-member ensemble, formed in 1969, has received great acclaim both at home and abroad performing America’s original art form, jazz. Concerts by the Jazz Ambassadors are designed to entertain all types of audiences. Custom compositions and arrangements highlight the group’s creative talent and gifted soloists. Their diverse repertoire includes big band swing, bebop, Latin, contemporary jazz, standards, popular tunes, Dixieland, vocals, and patriotic selections. The band has appeared in all fifty states, Canada, Mexico, Japan, India, and throughout Europe. Notable performances include concerts at international jazz festivals in Montreux, Switzerland; Newport, Rhode Island; Toronto, Canada; Brussels, Belgium; and the North Sea Jazz Festival in the Netherlands. In 1995, the Jazz Ambassadors performed in England, Wales, Belgium, Luxembourg, and the Czech Republic in commemoration of the fiftieth anniversary of the end of World War II. The band has also been featured in unique joint concerts with major orchestras, including the Detroit and Baltimore symphonies.